I have no improv or performing experience, can I still take class? Absolutely! Our goal is to create a safe, fun and non-judgmental space for all students no matter what level of experience. Who should take improv class? Improv is for everyone! No matter if you are an actor looking to sharpen skills or someone who just wants to break out of their shell and have fun. Our classes are designed to support the needs of anyone who walks through our doors. Let’s play! Improvhi offers a 3 level class curriculum as well as special workshops. See class descriptions here. 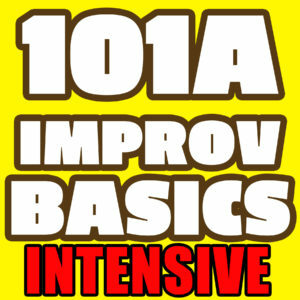 We recommend that all new improvhi students begin in our 101A class regardless of experience level. Most classes range from $10-$25 an hour. Our Improvhi Core classes are $75 per sub level which equals to 6 hours of instruction. 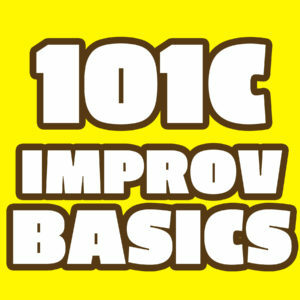 A regular improvhi core “sub level” (ex: 101A) classes meet once a week for 2 hours for 3 weeks. An entire “level” (ex: 101A, 101B & 101C) will meet for a total of 9 weeks. Intensives will meet for 3 hours for 2 weeks. Special workshops typically meet for one night for 2-3 hours. I can’t make it to all 3 classes in a sub level. Can I get a discounted price? We do not pro-rate classes. Students are asked to pay the full amount no matter how many classes are missed. What if I have to miss 2 out of the 3 classes? Can I still move on? Students are only allowed to miss 1 class per sub level in order to move on. Make up classes are sometimes offered, but not guaranteed. Can I sit in on a class to check it out first? Sorry. Class auditing is not permitted. 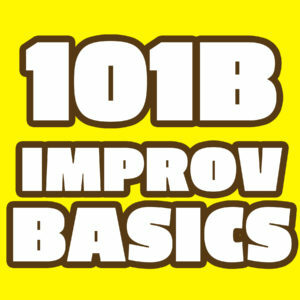 All of our Improvhi classes and workshops are held at Happiness U (located at SALT in Kakaako) and Impact Hub (located across from Whole Foods Kakaako). There is a paid parking structure in the building as well as ample metered street parking. Are all classes good for kids and/or teens? All of our classes are recommended for students 18 years and older unless otherwise specified. Do you offer classes for kids and teens? Yes. Please keep checking our online calendar for updates. See Improvhi instructor bios here. Improvhi Core Class Levels 101C, 201C and 301C have opportunities to perform in a showcase at the end of the session. When are your improv comedy shows? The Improvhi Team performs TWO FREE improv comedy shows first and third Saturdays at Revolusun located at SALT in Kakaako at 8pm & 9pm. Check our online calendar for details. Are kids allowed at your shows? Because our shows are made up right before your very eyes and ours, we recommend it for adults 18 and over. Shows may contain adult language and/or situations. Parental discretion is advised. How long are your Saturday shows? A typical show will run about 45-60 minutes. I am part of an improv team. Can we perform in your shows? Coolio! We’re always down to host special guests. Send us a note and we’ll be in touch. Didn’t find what you were looking for? Drop us a line!